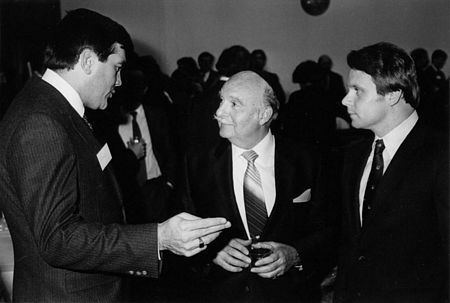 Washington, D.C., 1983 -- (L-R) Rep. William Coyne (D-Pa.), co-chairman of the 97th Congressional Class for Soviet Jewry, Rabbi David Hill, National Conference on Soviet Jewry Vice Chairman, and Rep. Christophery Smith (R-N.J.), co-chairman of the 97th Congressional Class for Soviet Jewry, at a recent inaugural Reception and Briefing of the 98th Congressional Class for Soviet Jewry. Reps. Coyne and Smith received awards for their continuous efforts on behalf of Soviet Jews. The event, coordinated by the NCSJ, was attended by newly-elected members of the House and NCSJ Executive Committee members. The Congressional Class for Soviet Jewry is organized in association with the NCSJ to help facilitate Congressional involvement on behalf of the Jewish minority in the USSR. It includes 77 Members of Congress, out of 80 newly elected to the House of Representatives.